Skordalia is a tasty Greek dip made from potatoes, almonds, and plenty of garlic. It has the most incredible flavor and a smooth, creamy texture. A tangy, garlicky and unexpected dip that gives hummus a run for it’s money! Potatoes rank pretty high on my list of favorite ingredients to cook with. They’re inexpensive, super versatile and contrary to popular belief, actually pretty healthy. Today I’m teaming up with the US Potato Board to bring you a recipe for a Greek style dip that’s so tasty, it might just replace hummus as your go-to healthy snack. Potatoes have gotten a bad rap when it comes to eating healthy. They’re always thrown into that dark, scary category of foods we’re all supposed to avoid, often being compared to refined grains and white sugar. But that’s unfair, because potatoes have so much more nutrition to offer than the latter. Unlike refined grains and white sugar, potatoes are whole, unprocessed vegetables boasting an arsenal of vitamins and nutrients. One medium baked potato has only 110 calories, zero fat, zero cholesterol, and is chock full of potassium, vitamin C, vitamin B6, iron and fiber. It’s all the butter, cream and oil that makes them bad for you (but also sooo delicious – let’s be real). Whether you’re still on the clean eating bandwagon or not, I’m here to tell you that you can – and should! – include potatoes in your diet without feeling guilty. If you’re a fan of hummus, baba ghanoush or other Mediterranean/Middle Eastern dips, you’re going to love skordalia. It’s much lesser known than the others, but just as delicious served with pita, veggies or even as a sauce for grilled meats. It’s supposed to be super garlicky, but if you’re sensitive, you can always dial that back. If it’s garlic breath you’re worried about, fear not: I have a remedy for that. Watch my video above to see how it’s made, then check out the recipe below for additional instructions and tips. And – BONUS! – I’m also sharing the US Potato Board‘s video on how to make a killer potato and butternut fritatta. I’m going to go make that for breakfast right now. Thank you to the US Potato Board for sponsoring this post. Place the whole, unpeeled potatoes in a large pot of room temperature water, season generously with salt, and bring up to a boil. Cook until the potatoes are fork tender (about 20 minutes, depending on size). While the potatoes are cooking, combine the garlic, almonds and 1 tablespoon salt in a blender or food processor and blend on high until pulverized. Add the olive oil, lemon juice and 3 tablespoons vinegar and continue blending until very smooth. Reserve 1 cup of potato cooking water, then drain the potatoes and allow to cool for a few minutes so they can easily be handled. Remove the skins from the potatoes, then press them through a potato ricer or mash thoroughly by hand. Do not place in the blender or food processor or they will turn gummy. Add the garlic almond mixture and 1/2 cup reserved cooking water while the potatoes are still warm. Mix and mash until totally combined and smooth. Taste and adjust seasoning/acidity as necessary (depending on how salty your potato cooking water was, you may need to add more salt), and thin out with more water to achieve desired consistency. 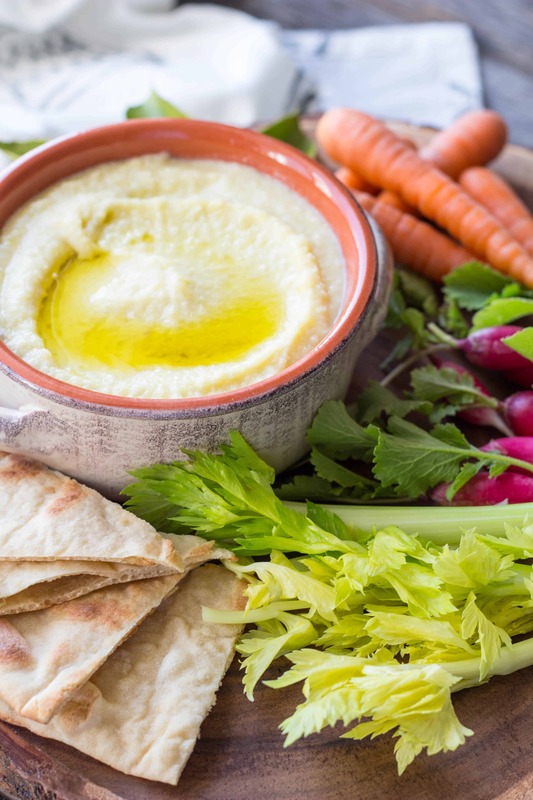 Serve warm or at room temperature as a dip for crudités and pita. Going to make this for the Super Bowl. Can I make it a day in advance? Thanks Coley!